Michael Kelly is a former Chicago cop who now works as a PI. Whilst waiting for a train he witnesses a woman being shot and gives chase. Lured into an alley he's knocked unconscious. In the meantime, a second woman is shot at another station. A city taskforce is established to track down the gunman, with Kelly given a peripheral place on the team due to the killer contacting him. He’s hardly a team player, however, and sets about trying to catch the murderer, who quite clearly is playing a game with him related to a past event. With the whole city on edge, the killer strikes again, ratcheting up the pressure and stakes. 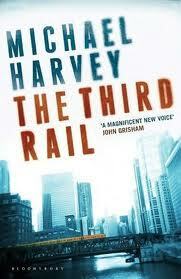 The Third Rail is the third instalment of the Michael Kelly series and the first I’ve read. The story is told at a quick pace using short chapters each with a tension point designed to keep the pages turning. This keeps the story moving along, but sacrifices character development and limits contextualisation. Kelly is a typical tough guy PI, is incredibly well connected, and just happens to find himself at the centre of a major incident which only he and his techie buddy can solve. Thrillers often teeter at the edge of credibility and The Third Rail wanders this line throughout, tipping over it at the end with a twist that was neither needed nor made much sense. Moreover, the task force investigation seemed overly amateur and divisive, and, interestingly, Chicago seems to have no surveillance cameras or useful witnesses. The result was a workmanlike thriller that lacked depth and resonance, with a plot and characters with whom I failed to connect. I tried the first book in the series and found the detective's hard-boiled patois very old fashioned and hard to swallow. Rob - I know what you mean about stretching credibility just tooooo far. Shame too as the premise sounded interesting. Yeah, I'll probably wait on this one.. 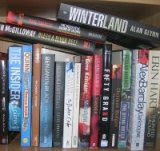 I've read a few of his, and I liked them fine, I just haven't kept up. Thanks for putting him back on my radar.